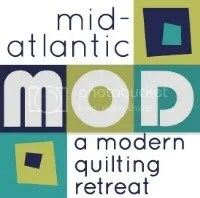 22 quilters, 1 goal: a fun weekend of quilting! 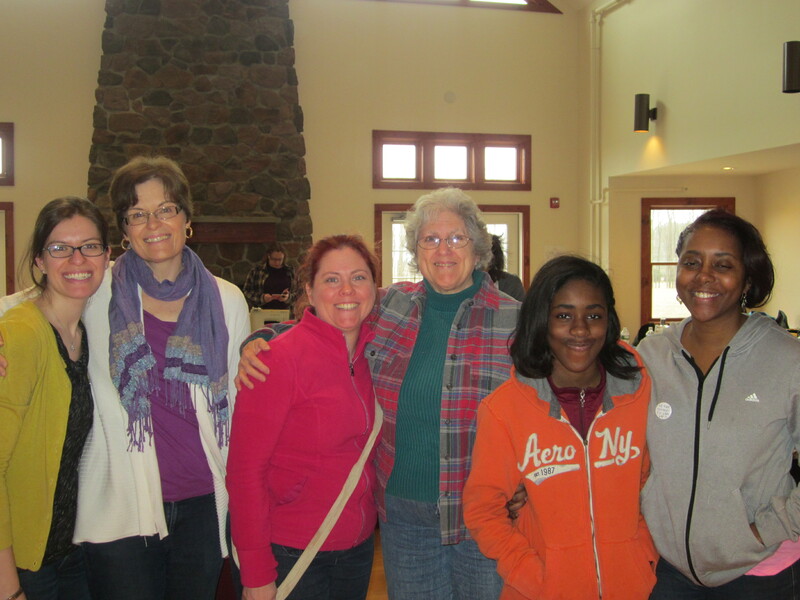 We had our first retreat March 21-23 at the lovely Crossroads Camp & Retreat Center in Port Murray, NJ. Twenty-two creative spirits, many of us members of NJMQG, gathered for a weekend of good food, fun, friendship and fiber. Some quilters knitted or crocheted. We had two first quilts completed, and an amazing number of completed projects. Because some projects are surprises, some of the photos will be shared at a later date. On Friday, our group arrived and got settled. We had the sewing tables set up in the great room of the Christ Center. In the middle, we had an area where our group could sit and chat, knit, crochet, or watch a niece in a gymnastics competition. Cutting and ironing was set up in one of the conference room, (a great way to get quilters to move and stretch), and a mini ironing station in one corner of the great room. While we were pampered by people to cook and do the dishes for us, quilters did what they always do….bring tasty goodies and treats. Most people were set up and sewing by the time we broke for our dinner. We dined on pizza and salad, with a few quilters sharing wine. Of course, where there are quilters, there is great food, and we had a mountain of tasty snacks, both sweet and savory, (and even some healthy options!) in between meals. After dinner, we spent a little bit of time getting to know each other. The wonderful thing about quilters is that we bond quickly, over one thing or another, and by the end of the weekend, new friends were made, and our creative wells were refilled. Another feature of the weekend was no planned project. Everyone got to work on their own pieces, and with no interruptions, except for dining. It did it seem like we had barely finished one meal when it was time for the next! Mom/daughter quilting…what could be better? We had three pairs of mother/daughter quilters! Some of us were early birds, some were night owls, and the center happily accommodated both. On Saturday morning, some sewed, some slept until breakfast. Each delicious meal was preceded by a whimsically sung grace…perhaps some of the other quilters remember the words, but two of the themes were Addams Family and Superman. After breakfast, we headed back to our machines, and worked until lunch; it seemed we had just started when dinner was served. In case you are wondering, the meals were fabulous, and the best part: not one of us had to plan, shop for, or cook the meal, nor do the dishes afterwards! Betsy Vinegrad demonstrates an easy way to sandwich a quilt. I took photos of everyone’s project, and will provide a link to that photo album shortly. I videotaped Betsy Vinegrad’s sandwich technique that she learned from Master Quilter (yes, this is a true title!) Sharon Schamber, and Mary Kirchoff building her beautiful pieced hexagons with the Hex ‘n More ruler. We got to know each other a little better, shared tips about quilting, food, life, and laughed a lot. I’m sure we recruited a few new members for our guild. Everyone who came seemed to enjoy themselves, so we are starting next year with 22 people who wish to come back, schedules permitting. There is still room for a few more at our next retreat! This is so wonderful to read! I heard nothing but glowing reviews from everyone. I’m sure there will be plenty of people interested to attend next year. I’m among them. Thank you to Aleeda for organizing and being such a wonderful hostess. This was the perfect retreat get away weekend. I can’t wait to do it again! To my new found friends from the retreat, thanks for the laughs and the inspiration! Every word of that description is TRUE. I left the weekend rejuvenated, refreshed, and thrilled that I now have MORE quilting buddies. I completed two baby quilt tops…one before I went to sleep on Friday, and one before bedtime on Saturday!! Good thing I brought some crocheting for the remaining time. No “classes” were held but we learned so much from each other. The weekend was a great gift that I gave to myself.